The Global Liberal Order has been constructed (and contested) since the end of the Second World War. This order now gets more fluid than ever with the rise of Russia and China, but more seriously with the Brexit referendum and the Trump victory in 2016. At the same time, however, the European Union (EU) and Japan have long shared the liberal values – both economic and political values. These two actors concluded their official negotiations over two significant agreements: Free Trade Agreement (FTA) / Economic Partnership Agreement (EPA) and Strategic Partnership Agreement (SPA) in December 2017. The main objectives of this research project are, primarily, to carry out the theoretical and empirical studies of EU-Japan relations within the context of four broad research areas, and subsequently, to establish a world-wide centre of ‘Inter-Regional Studies (IRS)’ in the academic field of Politics and International Relations. Establishing an IRS centre, it is imperative for us to expand our research networks involving the students of Asian / Asia-Pacific Studies, while strengthening our existing networks of European Studies around the world. 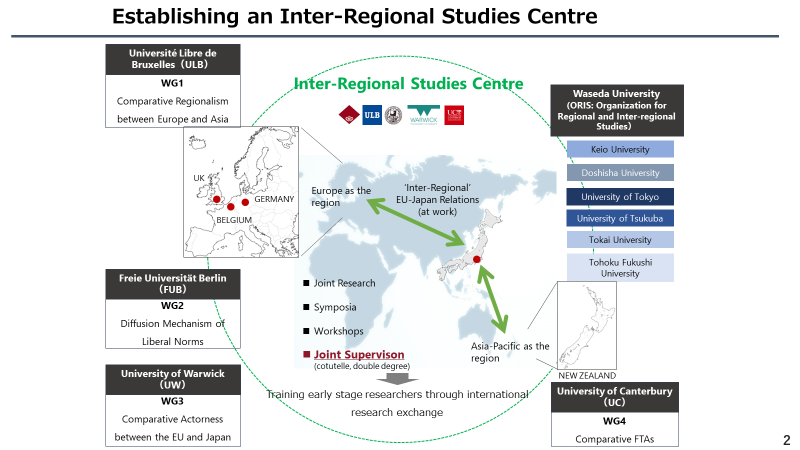 In the studies of the EU and European integration, Waseda University has already carried out the substantial research collaboration and exchange with (1) Université Libre de Bruxelles (ULB) in Belgium, (2) Freie Universität Berlin (FUB) in Germany, (3) University of Warwick (UW) in the UK, and (4) University of Canterbury (UC) in New Zealand. This research project will strengthen these existing networks, by including other research institutions in each country and in both regions: Europe and the Asia-Pacific. We will embark on this project with four working groups (WGs) in the following four broad research areas: comparative studies of European integration and Asian regionalism (WG1: comparative regionalism); studies on diffusion mechanism of liberal norms (WG2: norm diffusion); studies of international actors comparing between the EU and Japan (WG3: comparative actorness); and comparative studies of free trade agreements mainly concluded by the EU (WG4: comparative FTA). Another significant objective of this research exchange project is to encourage as many young (early stage) researchers, post-doctoral and doctoral students, and particularly to jointly supervise PhD students through the ‘cotutelle’ system which Waseda and ULB are carrying out within the GEM-STONES project. Joint Research: The above-mentioned four working groups will be jointly operated by two Waseda researchers and coordinators of the core institutions outside Japan. The co-directors of each group are tentatively as follows: WG1, Anne Weyembergh (ULB) and Paul Bacon (Waseda); WG2, Tanja Börzel (FUB) and Hidetoshi Nakamura (Waseda); WG3, Chris Hughes (UW) and Nakamura; WG4, Martin Holland (UC) and Bacon. These WG co-directors aim to expand and consolidate their research networks by inviting leading researchers not only from their own institutions, but also from other institutions in their own and neighbouring countries. Each WG intends to publish an edited book or a special issue of an academic journal. We shall also invite members of our overseas core institutions to the editorial board of the Journal of Inter-Regional Studies: Regional and Global Perspectives, which is an academic journal published by the Organization for Regional and Inter-regional Studies (ORIS) at Waseda University. This would help us to start publishing said journal via a major international publisher within a few years. Seminars: The core institutions in partner countries will organize international symposia on a rotation basis. It will give presentation opportunities to both senior and young researchers in our project. Workshops with a relatively small size will also be organized at times by core institutions and WGs. In partnership with the Top Global University (TGU) Global Asia Studies project based in Waseda University, ORIS will regularly organize workshops, which are mainly but not exclusively for young researchers. Calls for papers on the ORIS website would strengthen this international research network further by attracting interested scholars. Researchers in the member institutions, including young researchers, will publish their research outcomes in various platforms of our own, while targeting leading journals in Politics and International Relations. Scientist exchanges: Our counterpart institutions outside Japan will host short visits for seminars by our Japanese institutions’ researchers. Additionally, young researchers will pay short and medium-term visits in order to conduct substantial research for the four WGs. Regarding young researchers currently supervised by our members in Japan, we will give them an opportunity to stay in one of the counterpart core institutions for around ten months based on the cotutelle system or equivalent. In principle, four students (one for each core institution) will be selected for this exchange, and they will have a privilege to be supervised by leading scholars of the counterpart core institutions. Similarly, Waseda University will host short visits of researchers from partner countries, and medium-term and long visits by young researchers. Workshops of each WG will be organized more frequently when such researchers are visiting our university. All these mutual exchanges will positively contribute to the implementation of this joint research project.